Kentucky Christian University has a long history of providing a transformational education that integrates academic achievement, character development, and spiritual formation. We could not accomplish this important endeavor without a team of dedicated partners who are committed to helping make the dream of a Christian education a reality for so many students. Throughout the years the University has been blessed to have a number of men and women demonstrate their commitment in extraordinary ways. The President’s Circle is the core support system of people who value Christ-centered education and recognize the unique ministry that Kentucky Christian University provides. Through their contributions, each President’s Circle member plays a critical role in helping equip students for successful careers while training them to function as personal ambassadors of God’s Kingdom. As a result, the whole world is impacted through graduates that touch thousands of lives in our local businesses, schools, and churches. Provide consistent, generous donations of at least $600 per year to the KCU Annual Fund. Through these funds, the President’s Circle helps ensure the availability of resources in the General Scholarship Fund, which directly provides financial assistance to more than 70 percent of the current student body, and allows the University to best steward its resources. Promote Kentucky Christian University by encouraging family, friends, and associates within their churches and communities to explore the University and the opportunities it offers, and partner with us in providing Christ-centered education. Pray for God to do His work in and through the lives of KCU students, faculty, staff, alumni, and partners. This is vital to insure that KCU remains always in alignment with God’s direction and purpose. Special invitation to the annual Alumni Homecoming Banquet in the fall. Invitations to other special concerts, receptions, and events. Tax deduction for each generous gift. 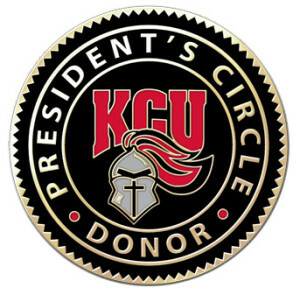 Please partner with all of us at Kentucky Christian University by joining the President’s Circle. Together we can help today’s students receive the Christ- centered, biblically based education they need to be tomorrow’s Christian leaders. Contact the Office of Development for help in setting up a President’s Circle membership.